Here's the slice...no big holes but very nice flavor. Oooooh, nice! I'll have to make it. I just made s Shokupan the other day which has been sliced and in the freezer so won't need more until near the end of the week. Have you ever tried this in a loaf pan? This is my first time with this recipe. I made it in a clay bread baking bowl so I could get a nice boule shape. 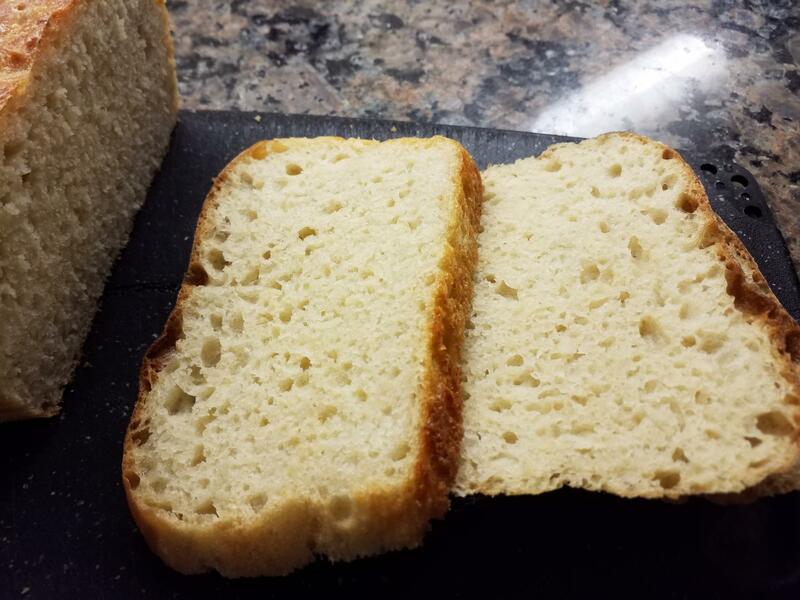 I'm impressed with the flavor and will make it again, it would make good sandwiches as well as nice for toast. That loaf looks great @lindag. I love the shape. I used the remainder of the sourdough last night and baked two ciabatta style loaves. The one on the right was baked in the CSO and the one on the left, that I forgot about and over-browned, was baked in the Oster. I sliced that one this morning. I made the peasant bread today that @lindag linked to above. This is a put everything in a bowl, mix together, let rise in same (unwashed) bowl, put in the pan in which you are going to bake it in, let rise uncovered, bake. I don't think I have ever made a one-bowl bread before. It was both easy and quick. Not as flavourful as one that is fermented longer, but if I were looking for something easy and fast, I would make it again. This was baked in my 1 quart ancient pyrex casserole dish. 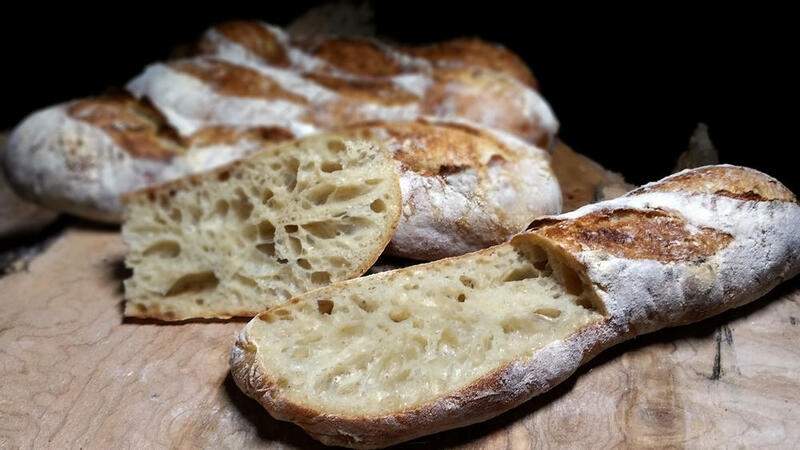 This No-Knead Crusty White Bread is next on my list. 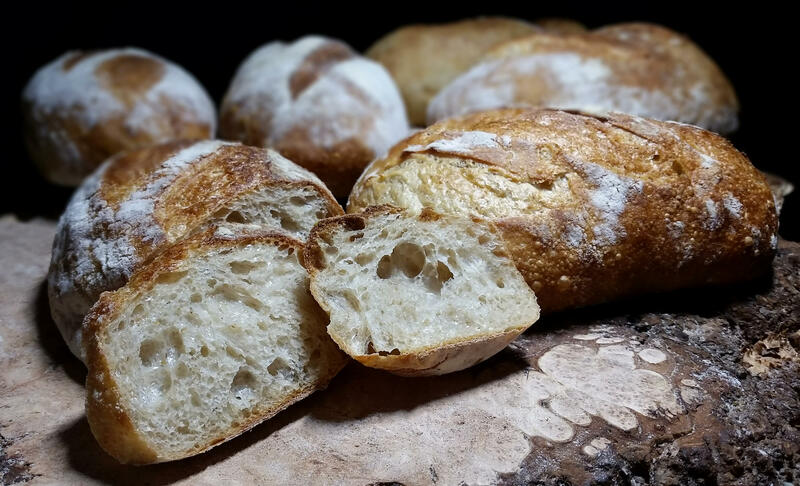 It's been on my list for some time since the CI No-Knead is one of my favorites. Coming this weekend, if not sooner. PS. I like that it is easily resized to one loaf which works best for me. I searched back though old posts. In my hands the bread function has never produced enough steam for my loaves. There must be a reason Modernist Bread did not suggest it. with my own bake on that setting. Sometimes, near the end of a bake, especially on loaves that rise higher, I slide a piece of foil over the top so that the crust doesn't burn. I have the book Artisan Bread in Five Minutes a Day on which this recipe is based. The only difference between the KAF one and that one is the amount of salt. One time I made a lot of it and I agree, it's good. I made John some grilled cheese sandwiches for lunch today using the peasant bread I made yesterday. It made amazingly good grilled cheese sandwiches, really crispy on the outside. He liked them a lot. I asked KAF about baking the peasant bread in a loaf pan and they suggested using the smaller pan de mie. 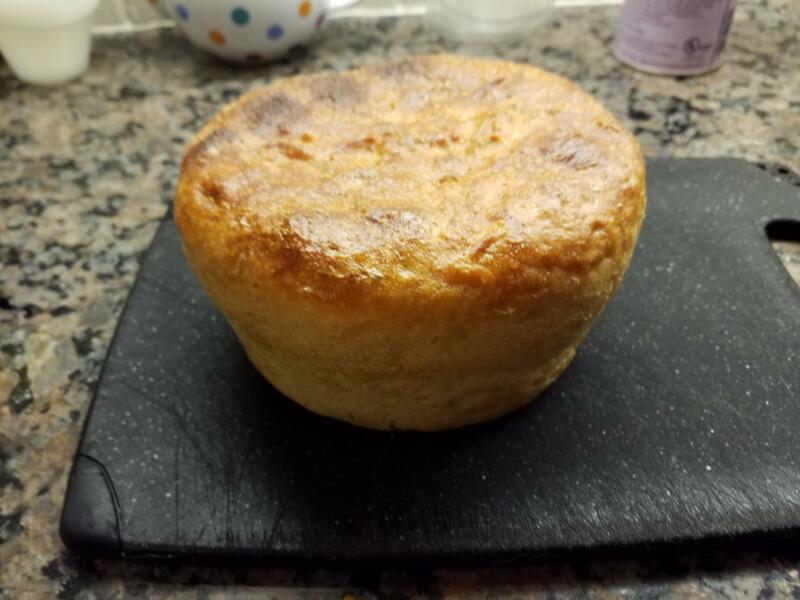 No, the crust of last night's boule was not as nice as last week's steam bake followed by convection bake. I'm not worried about the bit of burning. I chalk that up to a slight error in division of the dough, making the boule a bit too big for the CSO. 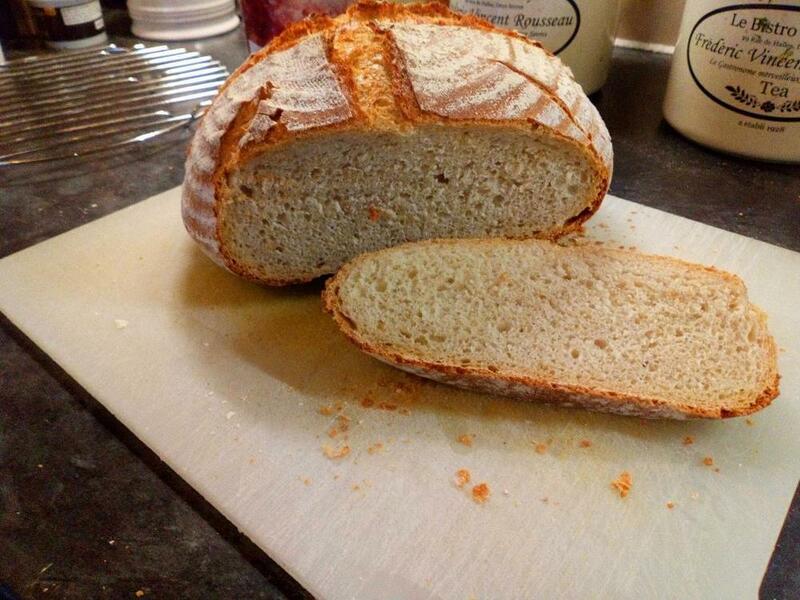 I can't speak for the crumb as I donated the boule to a dear friend to feed her starving teenagers. 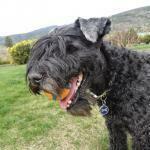 Edit: as of early this morning I'm informed the boule was all but gone. 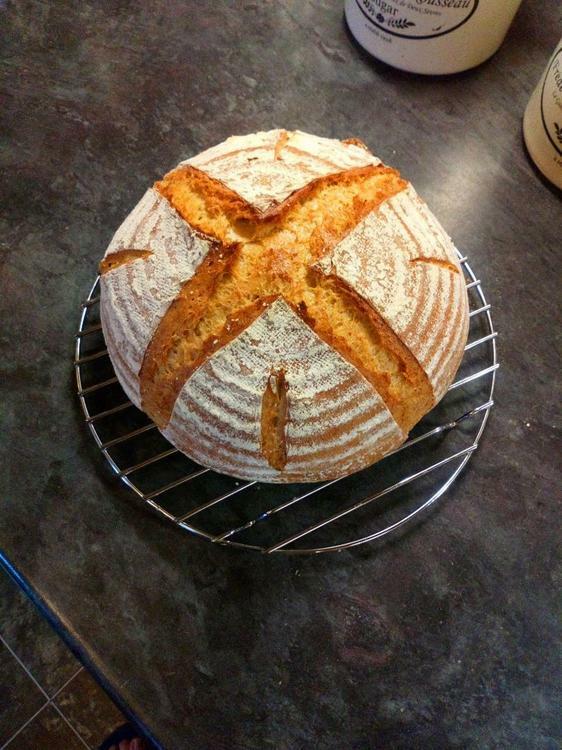 Yesterday I made my first attempt at No Knead Crusty White Bread in my Bread Baking Pot. It turned out beautifully and I'll post a picture of it after it's sliced. For now, it's bagged up and waiting. So many recipes that I need to try! 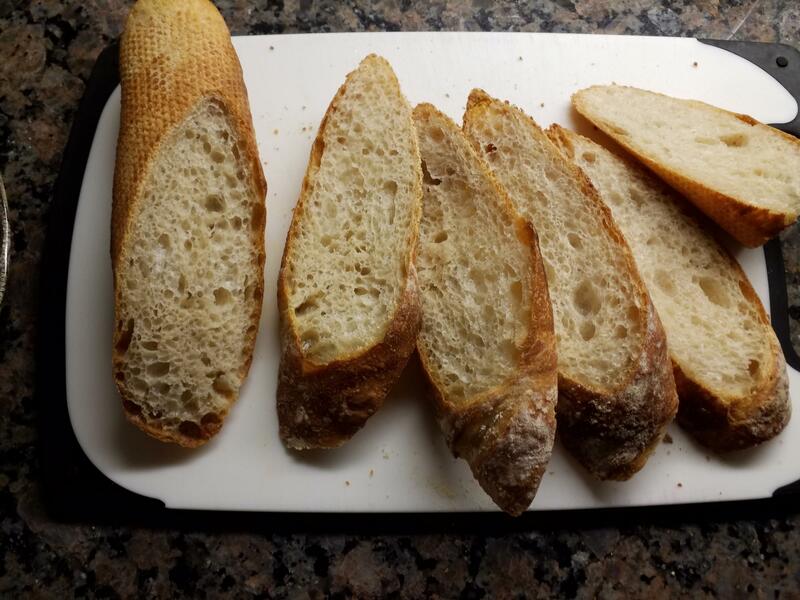 Sourdough Baguettes. Dough made Saturday and left in the fridge until early this morning. 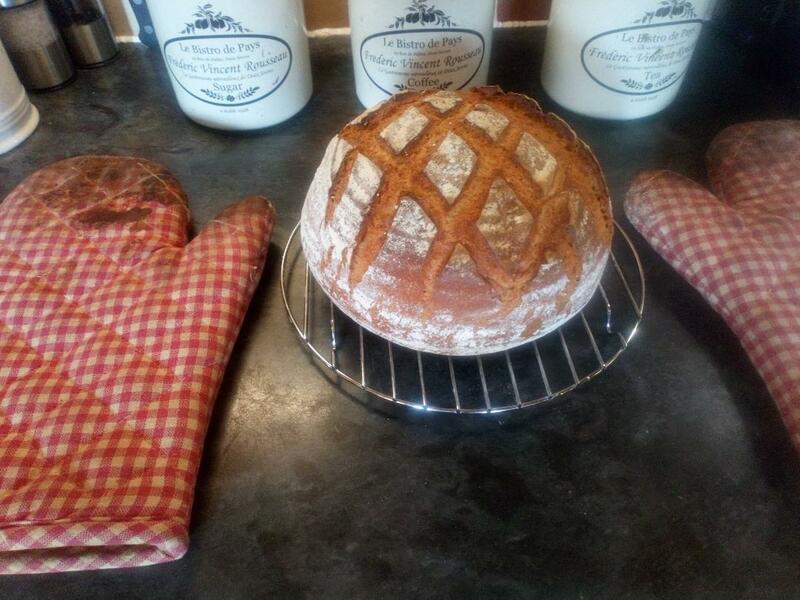 Baked in the CSO on the Bread setting. The first picture is of it cut up so you can see the crumb. Not entirely happy with it as it should have been holier, I think. That said, it was really good. The mother is made with rye flour, the biga with that starter and bread flour. I do think it proofed a bit too much but the finger dent test worked so I dunno. Maybe if Ann sees this she can comment on the crumb. 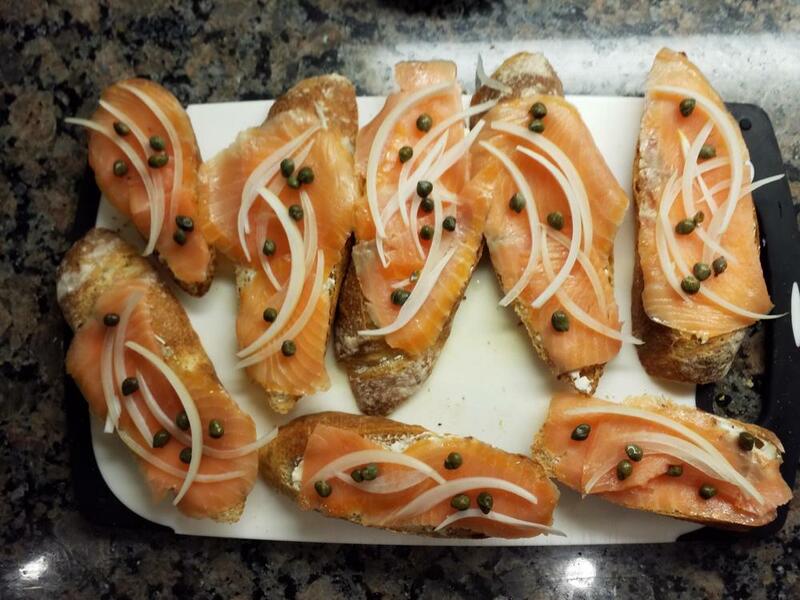 So, open faced smoked salmon sandwiches for supper. The baguette is all gone, fortunately there is more dough in the fridge. 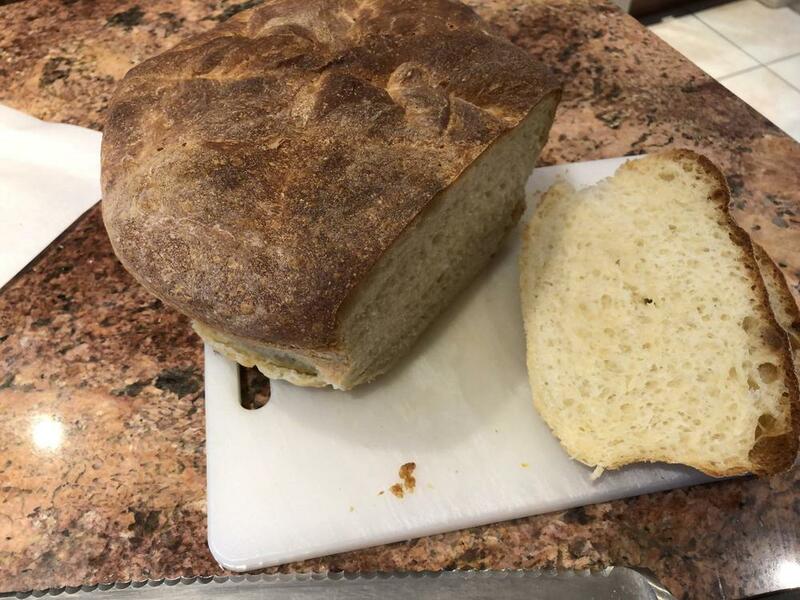 @ElsieD, Wow, your bread turned out great. 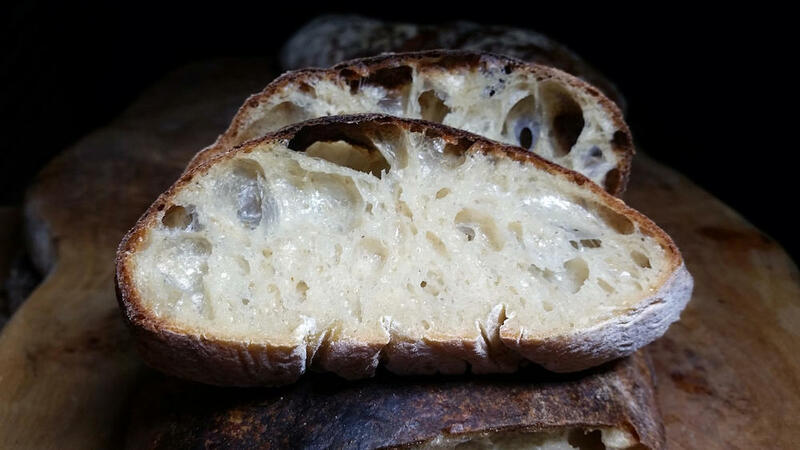 I even see a little shine on the crumb. The holes are achieved by hydration and good gluten development. I would be in heaven with your dinner. 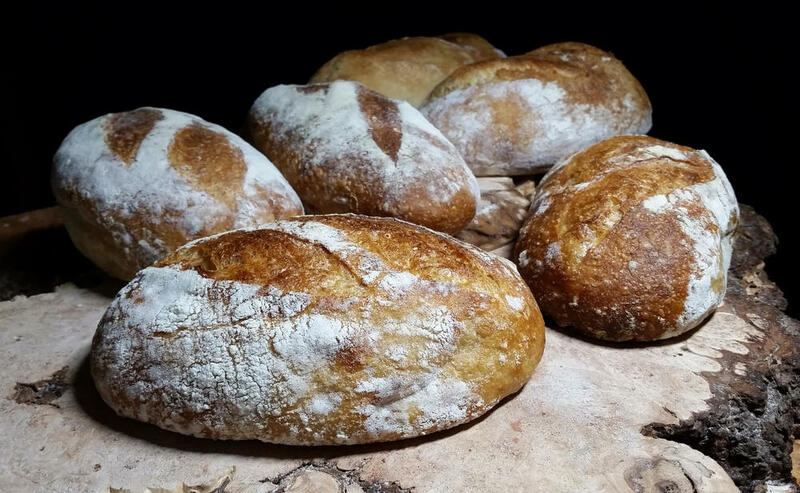 Wonderful bread. I love chewy crunchy bread like you both made. It is incredibly delicious but, when one pauses to think that is really only a few basic ingredients with the correct temperature applied .....compared to other delicious things to eat requiring so much more effort and resources. I'm late with my baking this week. Yeah, I wondered where you were. The last couple weeks I've been using slightly higher hydration, which I find allows the dough hook to grab better at lower mixer speeds. Oh, and for what it's worth this is ten minutes of steam for the boule. This is my second attempt to make a sourdough pain de mie. The first one did not work out as it refused to rise although I did get some oven spring. For that loaf I used starter straight from the fridge. With @Ann_T 's help and a lesson or two learned I set out to make a second loaf. On Wednesday, for the second loaf, I made a levain the night before. I mixed the dough at 9:30 AM, did the requisite stretch and folds and took it out of the oven at 9:30 that night. I ended up proofing it in the BSO on the proof setting to speed things along a bit or I swear I would have been baking it at midnight. When I tried to put the lid on the pan, it refused to go on, so it went into the oven as a regular loaf. Thursday we had grilled cheese sandwiches for lunch using this bread. The sandwich was perfection. I love this bread. Lessons learned are these: take 2 days to make this bread and use a levain. Ferment one day, bake the next, as it takes forever to rise. Secondly, if using the proof setting on the oven, let the pan come back to room temperature before baking and the lid will slide right on. Best loaf of bread ever. This is my second attempt to make a pain de mie. The first one did not work out as it refused to rise although I did get some oven spring. For that loaf I used starter straight from the fridge. 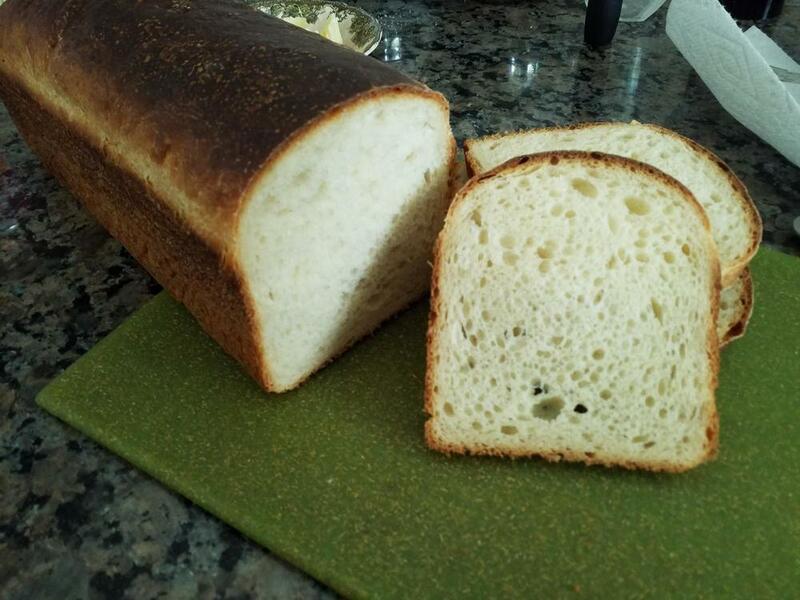 With @Ann_T 's help and a lesson or two learned I set out to make a second loaf. That is a lovely looking loaf! Is that the 13” pan? Thank you. Yes, it is the 13" pan. @ElsieD, that is one beautiful loaf of bread. I still haven't got around to buying one of those pans. I think I must. I think the last time I baked bread was March 4th. Hadn't fed my starter in over two weeks. 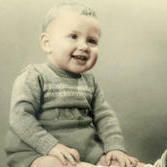 I had meant to feed it before we left for the hospital on the 12th but forgot. So Thursday morning I fed it and used the discard in a biga. The starter was a little slower starting but had doubled in about 18 hours. I left the biga out on the counter all day Thursday and Thursday night and it had more than doubled and was very active Friday morning. So I hand-mixed a batch of dough before heading back to the hospital. I added 100g of stone ground organic Red Fife whole wheat flour to the mix. The dough went into the fridge until Saturday afternoon. Matt took it out of the fridge early so that I could bake last night. 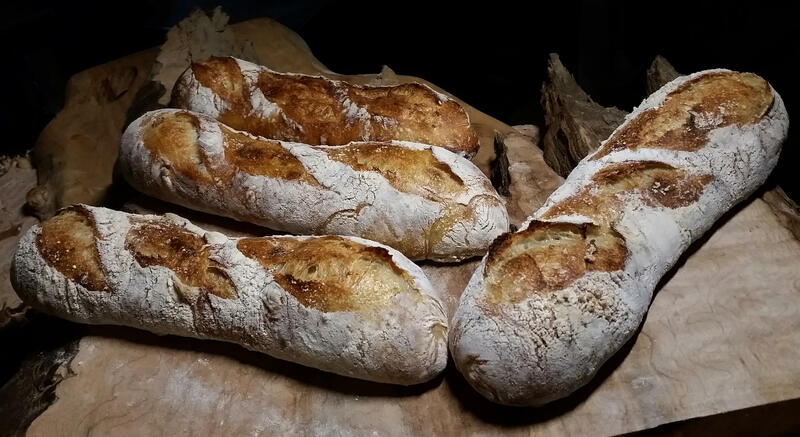 I'm not sure if it was the slowness of the biga, or the addition of the Red Fife but this bread has the most wonderful sweet gentle sourdough flavour. 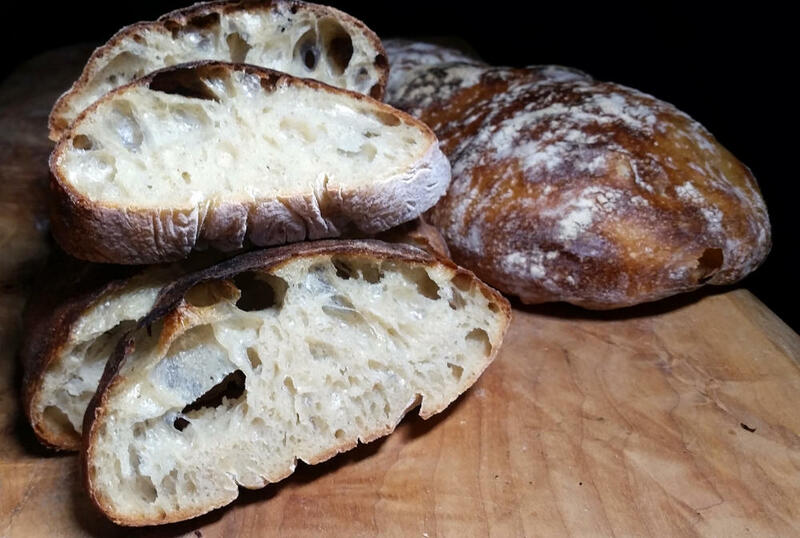 Crumb has lots of shine.